Design is based on a vintage pattern which has been re-worked and brought up to date using modern materials. A matching matinee set to compliment my ‘Gabriella’ pattern. 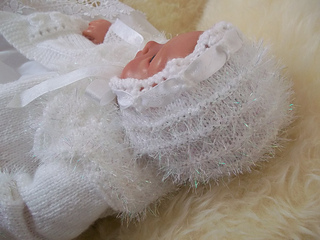 ’Gabby’ consists of a traditionally styled matinee jacket with a matching bonnet and a cute pair of t-strap shoes. Pattern requires DK Baby Yarn & a small amount of Fur Yarn on the yoke.